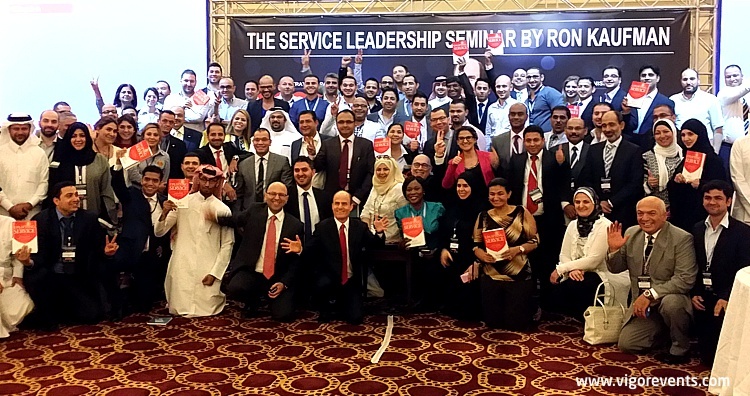 Qatar, May 13th 2014 – After the huge success of the Customer Service Guru in Kuwait, Vigor Events partnered with Interactive Business Network (IBN) to host Ron Kauffman again in the “Leadership in Customer Services” training day at La Cigale Hotel, in Doha. Ron Kaufman is one of the world’s most sought-after speakers and consultants in the field of superior customer service. The seminar focused on how to provide quality customer service, including best practice in establishing high-level service culture. The seminar was attended by top executives and specialists in service management and those interested in enhancing the customer service culture inside their companies and organizations. Ron Kaufman is also the author of UP! Your Service as well as fourteen other books in the field of service is rated one of the world’s “Top 25 Who’s Hot” speakers by Speaker Magazine for the powerful insights he has provided his customers from around the world for more than twenty years.